These charming fun animal soft enamel pin badges have been designed from some of my limited edition screenprints and etchings. Soft Enamel Pin Badges have the enamel placed in the recess of the stamped badge and when baked leave a nice dip which raises the metal above the enamel to give an extra dimension to the image. A charming gift for the animal lover. 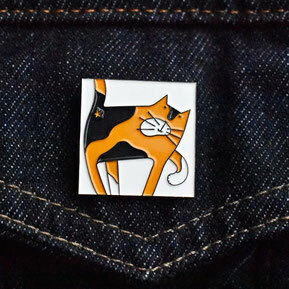 I have two different enamel pins available, Cat Scratch and Tom Cat. Click here to buy.